Overlooking the beautiful parc des eaux vives and lake geneva, this hotel is set in a large restored 19th century house, less than two kilometers from the center of geneva. There are just seven rooms set in the attic of this historic building, all decorated with soft, neutral fabrics. Rooms have dvd players, cd players, bathrobes espresso machines. Slanted ceilings give the rooms rustic charm. the hotel is chiefly known for its restaurants, which are also open to non residents... Geneva Hotels have been divided in 3 main categories : Luxury Hotels, Charming Hotels, Cheap Hotels, Of course the price and the level of service and comfort depend on the category - If you want to see all hotels listed please select your prefered hotels category and see our exclusive hotels rates - We wish you a pleasant stay. 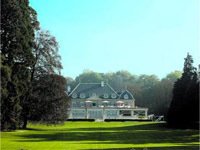 A unique 5 star hotel set in a the greenery - A reputated table ... One of the most exclusive hotels just 20 minutes away from the airport - This hotel is available to online booking - Enjoy your stay. Our website is dedicated to Geneva and its accomodations - This site also provides information about the city itself and the tours opportunities departing from the city - The Parc des Eaux Vives Hotel is one of the most exclusive properties selected - Room rates have been negociated and should be very competitive. We hope that this Geneva Luxury Hotel Website will help you in planning your trip - Thank you for visiting Parc des Eaux Vives website page : Booking and online reviews.